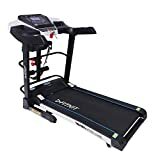 A treadmill is an excellent cardio equipment that can be used anytime within the comfort of your home to get the required workout. It is also considered healthier than jogging on hard surfaces. 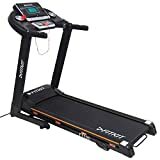 There are different types of treadmills, offering simple workout or advanced features to monitor your progress. You can also choose compact designs or large models based on the space available and your specific needs. It Has 2.0Hp Continuous Duty (Chp) Dc Motor Which Is Sufficient For User Weight Up To 120Kg. Although It Has 2.0Hp Chp Motor, It Consumes Less Power, 1 Unit For One Hour Of Usage As It'S A Green Efficient Motor. Free installation and service all across India. After Delivery please contact_us on:  to register your installation. (Note: Service Schedule varies location to location). Toll free number working hours 10am to 6pm on weekdays. Wheel for transportation, manual lubrication, Manual inclination, foldable and easy installation . LED display shows Time, Distance, Speed, Calories burned, Heart Rate, 12 Pre set programs, MP3 Speakers, Aux Port and Aux Cable. 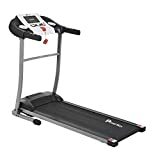 There are different types of treadmills, so make sure to choose the one that specifically addresses your needs. 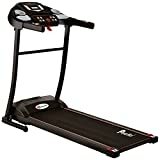 Manual Treadmills: As the name suggests, these treadmills operate only when you run or walk on the tread belts. These units don’t have many features, are lightweight and most affordable. Some models allow you to change the incline manually. Motorized: These treadmills feature an electric motor for driving a rotating belt. They provide smoother running/walking experience compared to their manual counterparts. They are also slightly larger in size. 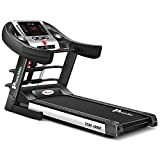 Hybrid Treadmills: This type of treadmill combines the designs of a motorized treadmill and an elliptical machine. You can experienced the belted movement on a foot track design that is typical to a stepper. Some treadmills come with a foldable feature so that you can store them after usage to save space. 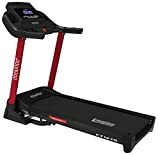 Features: You can choose a simple manual treadmill or a sophisticated motorized unit with features like electronic programming that varies the workout intensity. It can simulate running uphill or downhill. Some other features to consider include heart rate monitor, ergonomic design, displays, shock absorbers, and maximum sustainable weight. Workout Features: These features should be considered based on your physical and athletic needs. This includes the types of pre-set programs, speed levels, tilt levels, and resistance levels. Controls: Advanced models come with buttons for controlling speed, incline, and up/down. Some models can have all the controls on a touch panel. You should also consider the ease of access of the controls. Consider if it is easy and safe to change the speed or incline when you are running. Size: The size of the treadmill is also an important factor. It will depend on the space available in your home. 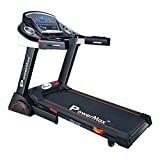 Once you have considered all the above-mentioned factors and types of treadmills, you should evaluate the different brands. 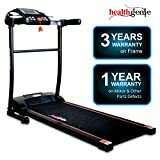 When looking for the perfect treadmill, keep all these points in mind. You should also evaluate the warranty and the price to ensure that you are getting the best deal.